Braun are synonymous with shaving and are a titan of the premium grooming industry; you know this, I know this, we all know this. 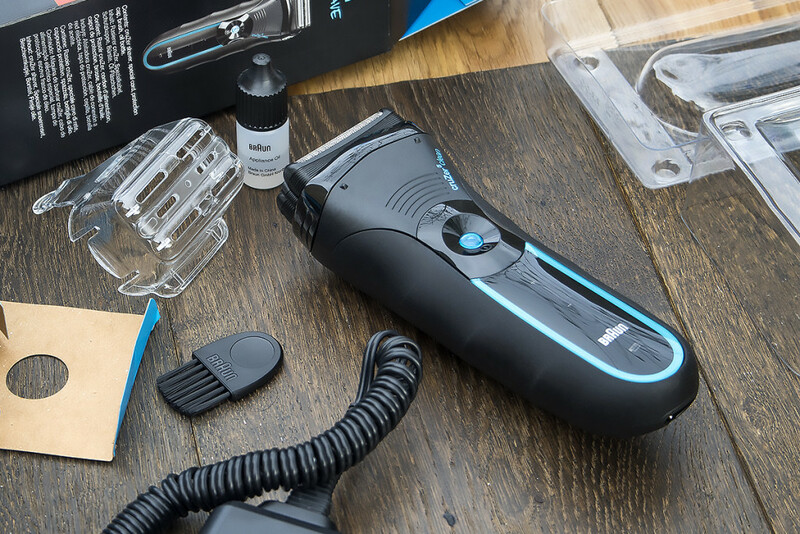 So it’ll come as no surprise that they’ve brought a killer to the market in the form of the Braun Cruzer 5 – a hi-tech, solid and german engineered grooming essential. Not only that, but in celebration of all things fashion and grooming related, Braun sponsored the E. Tautz show at this Winter’s London Collection: Men (LC:M). Check out the video of that below, it’s a great watch featuring their creative Director Patrick Grant – judge of The Great British Sewing Bee who I was lucky enough to spend some time chatting to at the launch of Tom Ford Noir Extreme earlier this year. The E. Tautz collection set out to capture the essence of working life in the North of England and Patrick’s inspired collection was complimented well with Braun’s renowned design and functionality. Now, I’ve slowly moved away from wet-shave razors over the last 6 months or so. Why? Because I just don’t see the point anymore in risking ingrowns and creating the hundreds of invisible micro-incisions on the skin that lead to damage in the long run. As a note by the way, the review section of this post is not sponsored and remains 100% non-biased, just in case you were wondering. I will also you in on a teeny-tiny secret. I’ve been shaving my face with an electric razor that’s sole purpose is for body hair removal and to be honest, I’d gotten quite good with it. The problems were, unsurprisingly, that it didn’t shave close enough and was still a little harsh on the skin; but it made me far more intrigued into moving over to foil technology. Therefore, when I got my hands on the Braun Cruzer 5, I was made up! The Braun Cruzer 5 is a very sturdy piece of kit; it feels solid to hold and the rubberised edges make it super-easy to grip, even with damp hands. The Cruzer 5 has 3 independent shaving elements that each operate and position themselves individually making for an incredible sculpted glide; it’s like a smooth buzzing cushion. You’ll also find a trimmer on the back that unlike many competitors, isn’t flimsy and limp. It’s perfect for getting those last bits of ‘tash and keeping those sideburns in order. 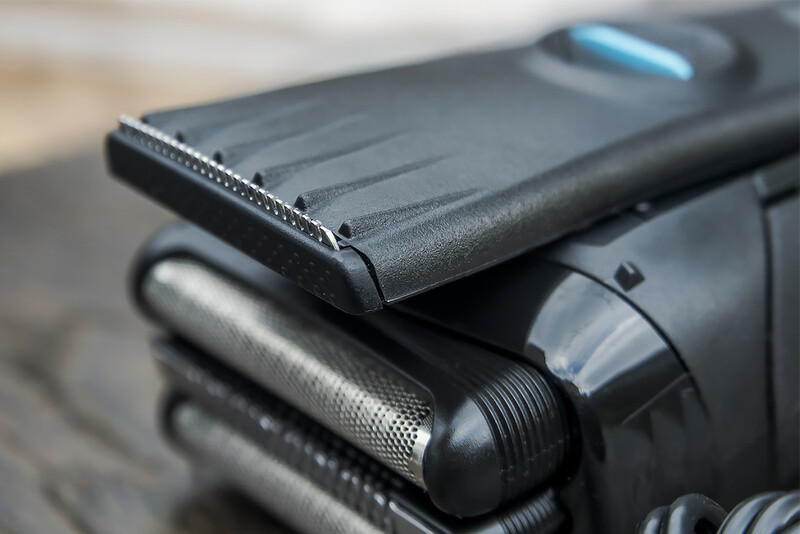 The Cruzer 5 holds 45 mins of shaving time and charges bloomin’ fast! As mentioned, you’ll get 45 minutes of shaving on one charge. I’ll be honest, shaving takes slightly longer than with a wet-shave but we’re talking maybe 60 seconds more; the advantage is that you can keep going up and down the same area without risk of irritation and damage. The precision trimmer is excellent and what’s I always think is missing with a wet-shave razor! It’s light in the hand but solid. 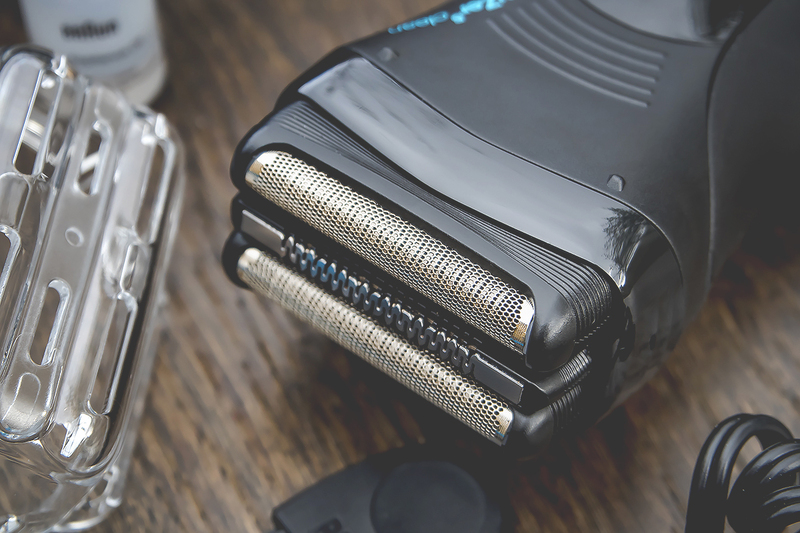 The triple foil blades really do give a close shave whilst giving ultimate comfort. Cleaning is super-easy as the head pops off and can be run under the tap to dislodge any hairs. I do have to point out though, the Cruzer 5 isn’t a wet/shower-use razor; if you want that, go for the Cruzer 6. In the box you’ll get the Cruzer 5 (obviously), a brush, lubricating oil (for the device, not you) and a head-guard. 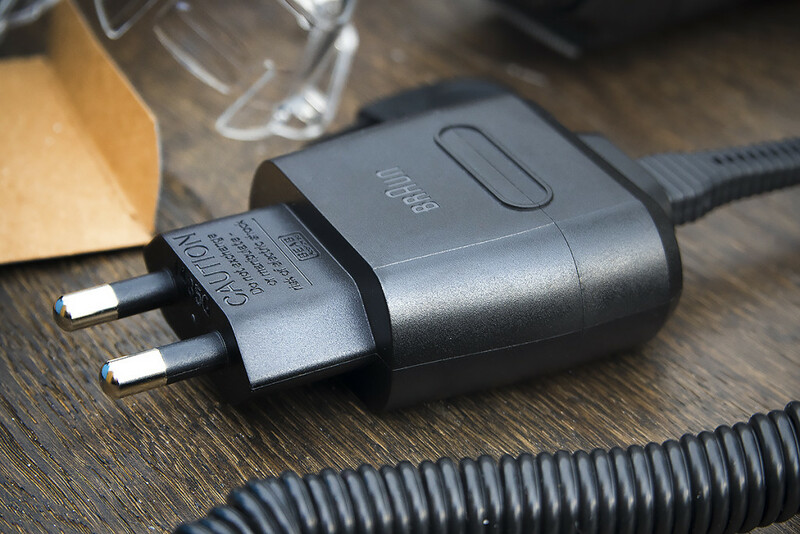 As well you get the SmartPlug which has an automatic worldwide voltage adjustment (100V-240V) making it perfect for travelling. There are no real drawbacks to the device itself but the only thing I’d say is that it could ideally come with a bag (although there is the plastic cap which does a great job) and it’d be hugely helpful if the back had been rubberised as it tends to slide around when it’s on charge if knocked. These are just minor niggles however, none of which effect it’s pretty awesome performance. I have to say, the Braun Cruzer 5 is a great piece of kit; I’m using this daily and will do for the foreseeable future. You’ll also be pleased to know that the Braun Cruzer 5 is available half price here from Superdrug and here from The Hut at £44.99 with free delivery! This article first appeared on MANFACE written by Thom Watson. It was published on Saturday 14th March 2015 and was last updated on Monday 3rd April 2017 at 1:33pm. It's categorised under Gadgets, Sponsored where you'll find more related content. 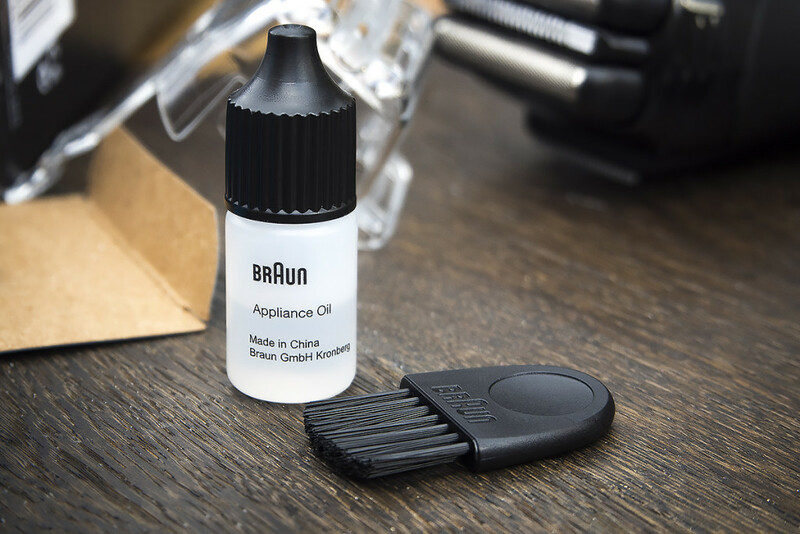 Braun is one of the top brands in men’s grooming department. Their electric shavers are among the finest out there. I had a Braun shaver that lasted almost 10 years. I think this says everything about the quality of their products. Seeing as how I left my charger for my razor in my hotel room in NYC, and it’ll cost about half of what a new razor costs to get it shipped to me.. I may have to check out this guy.